What do 3D printing, barrettes, and entrepreneurship have in common? They’re all crucial parts of MakerGirl. MakerGirl is a series of 3D printing workshops offered to young girls ages 7-10 in the community. Summer sessions just started and last through July 30th. Each session lasts a few hours and is very affordably priced. MakerGirl uses 3D printing to introduce young girls to the skills necessary to succeed in science, technology, engineering, and math (STEM) fields. It tries to get girls excited about algorithms and logic by having them create tangible objects. These objects tend to be wearable, like bracelets, barrettes, and keychains, but some girls have also made larger objects like big gummy bears and houses. These objects are small steps toward a very large goal of getting more women involved in STEM majors and, eventually, careers. As such, it’s an experimental project whose results cannot be fully known for at least another decade. The MakerGirl experience is fairly recent, but compelling, not least of which for its ambitions. Founded in November of 2014 by Julia Haried, Elizabeth Engele, and Sophie Li, all Business majors set to graduate in 2016, MakerGirl has not yet generated a lot of data about its work. But Haried does have a lot of stories — and a really cool R2-D2 figurine — that suggest that something is happening here. Haried notes how one girl, for instance, left MakerGirl and made a computer with her dad. “When her dad told her he’d signed her up for summer sessions at MakerGirl, the girl’s face lit up like a Christmas tree,” Haried recounts. At the very least, young girls are having fun making cool things with machines. I sat down with Haried (second-from-left) and Charlotte Israel, Caitlyn Deegan, and Stephanie Hein, in the busy Illinois MakerLab to talk about MakerGirl, how it was started, and what they hope it does for young girls and the future of innovation. Co-founders and collaborators of MakerGirl. Photo by Ashley Hetrick. Smile Politely: What is MakerGirl? Julia Haried: MakerGirl uses 3D printing workshops to introduce young girls to STEM fields. MakerGirl aims to get more girls into those fields. There’s a huge lack of girls within STEM; only 13% of women are in those fields, and we’re actively working to change this at a young age. They learn technical skills but they also are provided examples of who they can be one day. We serve as role models for them. SP: Why did you create MakerGirl? Haried: There are several reasons. The first is that, from a research perspective, 7-10 is the critical age where girls stop doing a lot of things — sports, activities, they start saying no to a lot of things. We want them to continue saying yes. From a personal perspective, we didn’t really have camps like this that showed us how cool STEM work is. For us for a long time, engineers were somebody else. But we can show these girls that engineers can change the world. We wish we had that. STEM fields are filled with people having meaningful conversations and we don’t want girls shut out. We want to create a generation that talks about more meaningful things, because STEM is changing how we do things. Caitlyn Deegan: In college, a lot of our professors talk about the gender gap — it’s a 70/30 men/women ratio, generally. They say “we’re happy to have you here," but the burden is on us, the students. Once you’re already in college, it’s too late to change those ratios. So we wanted to stop talking about the problem and start doing something about it. SP: Why 3D printing as the technology of choice? Stephanie Hein: We’re taking advantage of the amazing resource our University offers. This 3D printing lab is one of very few available at Universities around the nation and it’s the first at a Business school. Also, girls get to make things that are physical, not just code. They can make a bracelet that they can actually wear, and that gets them excited. Photo courtesy of Illinois MakerLab. SP: How many girls have participated in the program thus far? Haried: 80 girls have gone through so far. A few hundred should go through this summer. We really want to more than double the amount of girls, and are trying to quadruple the session offerings. SP: What do girls who participate in MakerGirl go on to do? Have they expressed interest in STEM beyond the sessions? Haried: We send home an activity sheet with suggestions for parents to buy toys like Miss Possible and littleBits or apps like The Robot Factory, or engage in hands-on activities to encourage STEM education with their girls. We know that at least one girl does coding after school (she displayed her coding projects at one of the MakerGirl sessions), which was great because we have no idea how to code and here's this 7-year-old girl showing us how. SP: Any words of advice for other entrepreneurs out there? Haried: The co-founders took classes like BADM 321 and 380 that are about fostering entrepreneurishing on campus, and which also give opportunities to faculty to pursue those ventures. Use resources available to you, including the 3D Prining Lab, which is open to everyone for free. You only pay by the gram — $.15 for students and $.35 for non-students — so it's worth it. Charlotte Israel: Also, research shows that successful people in any field combine technical skill with creativity. 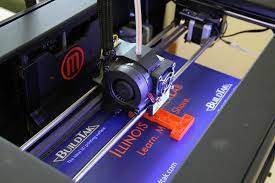 Come out and learn 3D printing, which can give you skills that benefit you in everything you do.